Browse: Home / 2016 / October / Sci-Fi This Week: DC’s Heroes Return To The CW! The wait is over: Arrow and The Flash make their big returns to The CW this week! 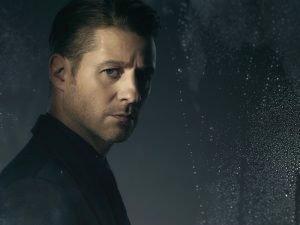 Two of our favorite comic book shows are back with their fifth and third seasons (respectively), promising to take the DC television universe in exciting new directions. 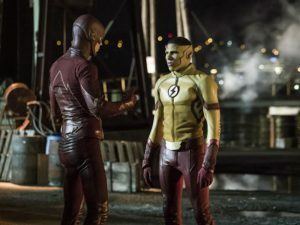 On Tuesday it’s The Flash, as Barry comes to terms with the massive changes he has caused to his world by going back in time and saving his mother’s life. And Wednesday on Arrow Oliver is the new mayor, but at night must fight alone after his team breaks up. 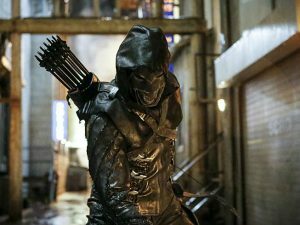 Look for new heroes this season as Arrow adds Mr. Terrific, Artemis, and more to the roster. Supergirl and DC’s Legends of Tomorrow will be making their debuts next week, starting the network’s 4-night DC Superfriends block. “Look Into My Eyes.” Hypnotist Jervis Tetch/Mad Hatter arrives in Gotham to search for his sister, Alice, and hires Gordon to help find her. Meanwhile, Penguin decides to run for mayor and Bruce’s doppelganger begins to channel him, causing some confusion around town. “Flashpoint.” Barry is living his dream life — his parents are alive, he’s asked Iris West on a date and he can finally be a normal guy as Central City has another speedster, Kid Flash, running around saving the city. When disaster strikes, Barry must decide if he wants to continue to live in this world as Barry Allen or return to his universe as The Flash. “Legacy.” Oliver takes to the streets solo to protect Star City’s citizens, forced to deal with a city that has become overrun with both criminals and a slew of new (and painfully inexperienced) vigilantes. Watching Oliver try to balance his jobs as both the mayor and also the protector of Star City, Felicity suggests he form a new team. Meanwhile, the flashbacks take us to Russia where Oliver faces off against the Bratva. “The Other Shoe.” As Storybrooke continues to welcome the new arrivals from the Land of Untold Stories, families, friends and even long-lost enemies are reunited once again. 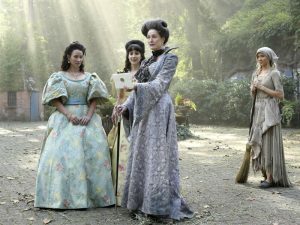 When Ashley (Cinderella) searches for her step-family, intent on settling their unfinished business, Emma, Hook and Henry scramble to help her before it’s too late. Meanwhile, Regina attempts to bribe Mr. Hyde for information about how to defeat the Evil Queen and Snow helps Dr. Jekyll find a suitable laboratory for his work. “Chestnut.” A pair of guests, first-timer William and repeat visitor Logan, arrive at Westworld with different expectations and agendas. Meanwhile, behavior engineer Elsie Hughes tweaks the emotions of Maeve, a madam in Sweetwater’s brothel, in order to avoid a recall. Cocky programmer Lee Sizemore pitches his latest narrative to the team, but Dr. Ford has other ideas. The Man in Black conscripts a condemned man, Lawrence, to help him uncover Westworld’s deepest secrets.